The Mushara Outpost accommodates 16 guest in custom made tent like structures, of wood and canvas which are nestled on the banks of an ancient dry river bed known to the locals as an " omaramba". 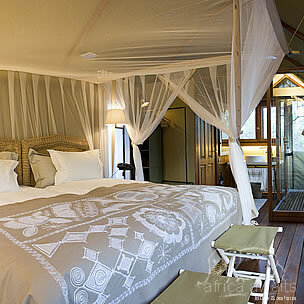 Each tent is set on a wooden deck, a meter and a half above the ground, giving us a different perspective of the bush. 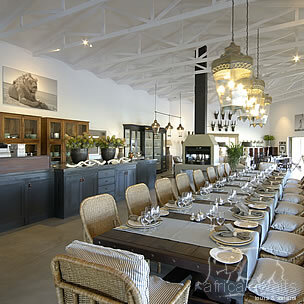 A large glass sliding door leads into the tent, all windows and doors are covered with fly-screen. Large glass windows from ceiling to floor allow for plenty of air movement during night. For the very warm afternoons, air conditioning adds an extra level of comfort. The open plan bathroom has an enclosed toilet with ceiling and two large windows. The shower walls are glass from top to bottom. Unzip the outside canvas wall of the shower to your preferred height and your time in the shower takes a new dimension. The furnishing of the tent is minimal, comfortable and has a light feel to it. A mini bar, coffee station, safe deposit box, telephone, mosquito net , hair drier and air conditioner are standard. On our game drives guests experience a fascinating perspective of wildlife in Etosha. Our vehicles have an all wheater safety design for the wet and dry season- they offer a 360 degree open-air unobstructed view - optimal height for visibility in spacious and comfortable atmosphere - up-to-date game movement information and thereby a high success rate in game spotting. 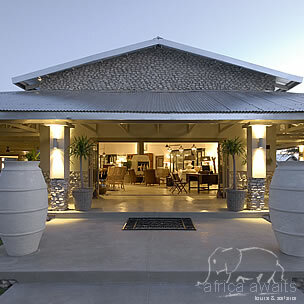 With your holiday, safari or business trip from in to The Mushara Outpost in Namibia.